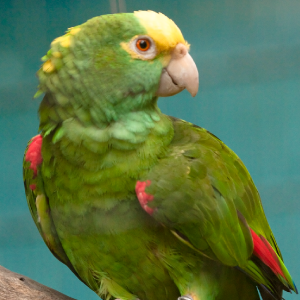 Yellow-crowned amazons are monogamous and will breed between December and May. The female will prepare the nest and incubate the eggs, while the male forages and feeds the female. From central Mexico to central South America, including the Amazon Basin and as far east as Peru. Also found on Trinidad and other Caribbean islands. Found mainly in tropical forests (both humid and dry), deciduous woodland, and tall scrubland. They can sometime be found in agricultural and suburban areas. Bright green plumage with flight fathers edged in dark blue. There are yellow markings on the head and face. The tail is shortish and squared off. Photo by Peter Tan (https://www.flickr.com/photos/petepictures/3643870394). Photo has been cropped.